Imagine, a short ride through the country in St. Cloud, and down your own private driveway you arrive at your secluded, Florida paradise complete with a pool, barn, pond, and NO HOA! 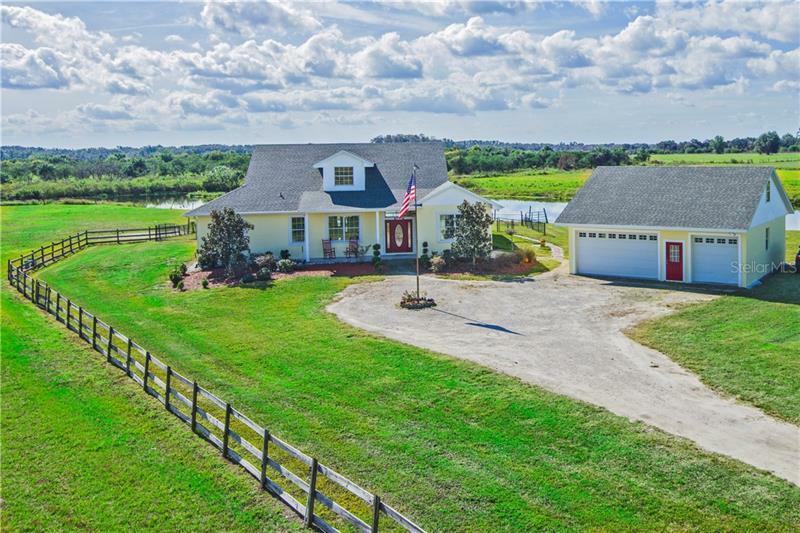 6.12 acres with a beautiful, open concept, split bedroom, 2638 square foot, 4 bedroom, 2 bath home, detached 3 car garage, pool, a gorgeous pond, and a barn. Finish each day on the back patio overlooking the pool and pond and watch the sunset. True hardwood floors are throughout the kitchen, dining room, living room, master bedroom, and one other bedroom. The large kitchen with lots of storage overlooks the family room and living room, as well as the back patio just beyond the french doors. The stunning master bedroom with tray ceiling also features french doors that open to the patio and pool. Both the front and back porches are adorned with pine wood ceilings. The home had a complete re-roof in 2017 and the AC unit is just 4 years old. The 3 car garage has an upstairs apartment that just needs finished to become the perfect guest quarters or mother-in-law suite. And to think, you're just 2.7 miles from the public boat ramp at West Lake Tohopekaliga and Cherokee Point Conservation area complete with a boardwalk, playground, hiking, canoe/kayak launch, fishing, wildlife viewing and more! This is the chance of a lifetime to own the home and property of your dreams! Be sure to check out the video! Additional Water Information: Property is just 2.7 miles from West Lake Tohopekaliga and public boat ramps. Amenities Additional Fees: HOA maintains the ponds or allows use of equipment to maintain ponds.